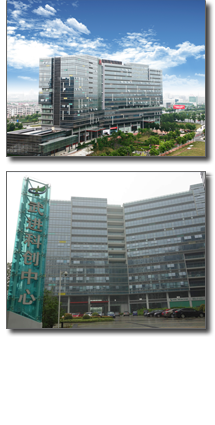 The goal of the Zoz-GIC Center is to promote Zoz technology and business as well as to support the entire Zoz Group in China and to develop advanced and most frequently nanostructured materials on site. Additionally a small scale manufacturing of the same is offered which is oriented in the range of several kilos upto a few hundred kilos per month. This all is done since the opening and in close cooperation with the University of California, Berkeley. by utilizing Zoz global infrastructure and by means of close co-operation with local universities in order to offer solutions in materials science and process engineering in applications like nanocrystalline& amorphous materials, ODS, MMC, MCC, CCC as well as M/C-Polymer compounds in the field of advanced materials for industry, life, energy and nature-saving. Also for high-performance materials and technology and hence for us, China is an important market with enormous future potential. Thus already in 1999, we have provided the first smaller plants to China, the first industrial plant followed in 2007. At the beginning, facing a quite high cultural and language barrier, the local market presence in China turned out to be very difficult for us and has been covered over the years with a small liaison office. Due to globalization, the world is not only becoming “smaller” but also more transparent and as at Zoz e.g. Chinese colleagues belong to the pleasant daily schedule, bilateral relations and institutions have been established. And so for us of particular importance is the German Innovation Center, established in Changzhou in China as well as in Dusseldorf in Germany. 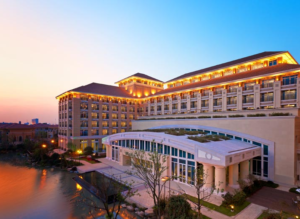 GIC is a Sino-German joint venture, making our technology bridge in the Chinese market. The Zoz-GIC Center is an independent activity inside Zoz Group representing all Zoz products and services in the Center’s hemisphere. This predominantly for Zoz GmbH which guides to advanced materials and their processing and manufacturing. If you visit us from outside of China, you arrive at the „Shanghai Pudong International Airport (上海浦东国际机场)“ and may take a taxi to the „Shanghai HongQiao Railway Station (上海虹桥)“. From there the trains take you to „Changzhou Main Station (常州火车总站)“ (trains D3046 or D3058/D3055). 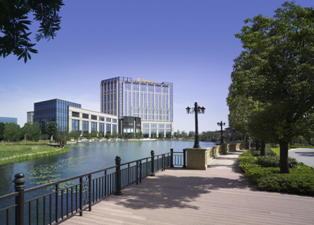 From there you take a taxi to the German Innovation Centers in TianAn Cyber Park, Chang Wu Nan Road (常州天安数码城588号) or to the Shangri-La Hotel, Xihu Road No. 2 (香格里拉酒店2号). Distance is about 230 km, transfer-time about 2:30 h.
Alternatively, the Nanjing International Airport at a distance of only 80 km with a commuter time of about 80 min but less flight connections does offer a closer hub. 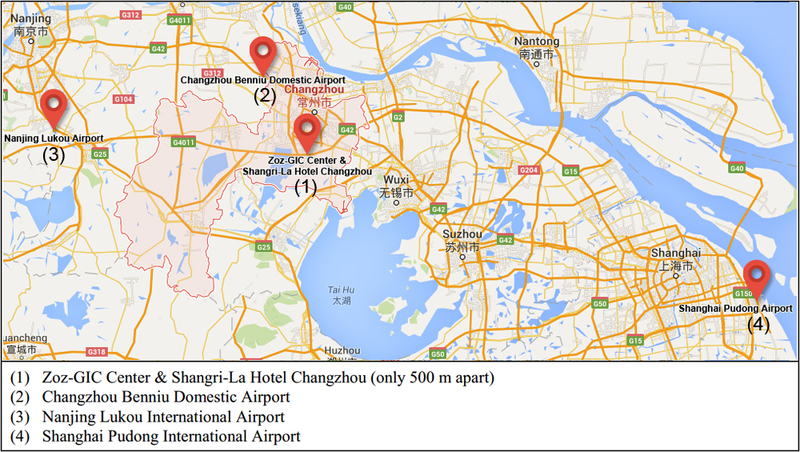 If you visit us domestic, you arrive at Changzhou Benniu Airport which is about 40 km from the Zoz-GIC center. Transfer time is about 40 min at excellent connections.